Home Out Of Office The Dragon Boat Challenge returns to Nottingham – Enter your team today! The Dragon Boat Challenge returns to Nottingham – Enter your team today! East Midlands Business Link has sponsored the eleventh Nottingham Riverside Festival Dragon Boat Challenge which takes place this year on Sunday 4th August 2019. The event should be a great team builder for firms across the East Midlands and takes place on the River Trent at Victoria Embankment where more than 40 teams are expected to compete a 200m race course, watched by several thousand spectators. 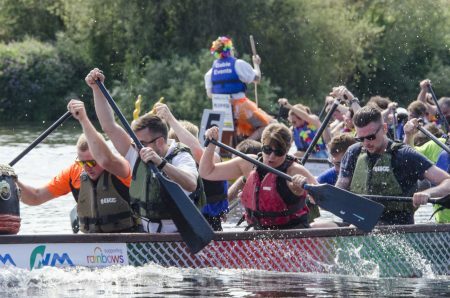 The Dragon Boat Challenge, also raises much needed funds for Rainbows Hospice for Children and Young People – a hospice in the East Midlands that provides vital care and support to babies, children and young adults with life-limiting illnesses from across the region. The Riverside Festival is one of Nottingham’s largest family events and includes a bustling fair and vibrant mix of music, dance, crafts and food from around the world staged by Nottingham City Council. It’s every parent’s worst nightmare to hear that their child will die before them – but for over 49,000 mums and dads across the UK, it’s a nightmare that’s all too real. Rainbows is the only hospice in the East Midlands that provides vital care and support to babies, children and young adults with life-limiting illnesses from across the region. We also look after the wider families – mums and dads, brothers, sisters and grandparents – because life limiting illnesses affect everyone involved. By taking part in the Dragon Boat Challenge, you and your crew will have the chance to make a difference to over 400 families from across the East Midlands. By fundraising for Rainbows, you can allow these families to make the most of the short time they have together, making precious, happy memories they can treasure forever. Tom Stanyard, Corporate Partnership Fundraiser at Rainbows, says: “The Dragon Boat Challenge is an amazing event. With up to 50 companies competing for a number of prizes, the day has a great atmosphere. More amazing than the event however, is the generosity of the crews who take part. It is only through your support at events like this that we’re able to help and care for those families who need it most. To find out more about the Dragon Boat Challenge, sponsorships, or to enter teams please click here.